The Intimidation Clothing-sponsored XFC is scheduled to host its next open tryout later this month, as the organization will look to lock down new talent on January 25th at Charleston MMA in Hanahan, South Carolina, which is also an official Intimidation Clothing retailer. The tryouts have an exciting prize on the line – a 5-fight contract with one of the few national MMA organizations in the United States. The Florida-based promotion has had its events broadcast on AXS TV for the past few years, and looks to grow even more heading into 2014 with international expansion scheduled. Joby Sanchez won the XFC’s last open tryout in 2012, and he has gone on to win his first two bouts under the XFC banner. For more information on the tryouts, visit the page here. ARE YOU THE NEXT XFC SUPERSTAR? The XFC prides itself on finding the next generation of MMA superstars. We welcome those looking to further establish their career by calling the XFC their home. If you have the talent, drive, & the dream to become an XFC World Champion, now’s your shot! The XFC is seeking the top fighters; next generation fighters, to be featured on television for the World to see. In 2014, we will continue expanding our Male & Female divisions, as we further establish XFC title runs. ALL fighters in all weight classes, PRO or those looking to make their Pro Debut, are encouraged to tryout! Intimidation Clothing continues to grow on the national scene, as the brand is becoming more and more visible to larger MMA audiences across the country. Intimidation has become a regular staple on AXS TV, the cable network which shows more live MMA than any other channel. Recently, two MMA events that the brand has sponsored have been featured on the regular Friday night “Inside MMA” program with Kenny Rice and MMA legend Bas Rutten. Highlights from both Colosseum Combat XXVII and HardRock MMA 59 were both shown on the December 6th episode. Colosseum Combat XXVII took place on November 23rd in Kokomo, Indiana, while HardRock MMA 59 took place on the same date in Somerset, Kentucky. Intimidation has been a longtime sponsor of the two organizations, which are two of the best regional promotions in the country. Over the past two years, Intimidation sponsored fighters and Intimidation logos have been the norm on Inside MMA’s highlights thanks to the fantastic promotion of Colosseum Combat MMA promoter Mark Slater, one of the most enthusiastic promoters in the business. Intimidation continues to become an even more regular face on AXS TV as the brand recently signed a deal to sponsor XFC events. The deal will begin on Friday night, as XFC 27: Frozen Fury in Muskegon, Michigan will be sponsored by Intimidation with the company’s logo visible inside the cage. In addition, UFC veteran Ryan “The Tank Engine” Thomas will once again be sponsored by Intimidation marking his 3rd straight fight with Team Intimidation. Intimidation Clothing is pleased to announce its sponsorship of the upcoming XFC 27: Frozen Fury event, which goes down on December 13th in Muskegon, Michigan. The event is set to air live on AXS TV, as the organization continues its partnership with AXS TV Fights. Intimidation also sponsored the XFC 23: Louisville Slugfest event earlier this year in Kentucky. One of the biggest MMA events in the state of Michigan in years, XFC 27 is set to feature multiple notable fighters, including Deivison Ribeiro vs. Farkhad Sharipov for the organization’s featherweight title, and Team Intimidation sponsored UFC veteran Ryan Thomas vs. Strikeforce and Bellator veteran Dom Steele. The 6-fight main card airs live on AXS TV, beginning at 9p.m. ET. Intimidation Clothing is pleased to announce a sponsor partnership with the Xtreme Fight Championship (XFC). The deal with the Tampa, Florida based MMA promotion begins immediately and is expected to include live AXSTV branding in 2014. The first Intimidation-sponsored event in the new deal will include XFC27: Frozen Fury on December13th in Muskegon, MI – one of the biggest MMA events to come to the state of Michigan in years. The two parties first worked together in April 2013 at XFC 23: Louisville Slugfest in April in Louisville, Kentucky and the companies have remained in contact since that time. However, after months of discussion, a deal was struck for a deal to greatly benefit both parties. Over the years the Intimidation brand has sponsored a variety of fighters inside their cage live on AXSTV including Team Intimidation mainstay Ryan “The Tank Engine” Thomas (pictured) as well as Luis “Sapo” Santos, Shamar Bailey, Johnny Buck, Jason Hicks & more. Fans can follow the XFC on Twitter @OfficialXFC. Intimidation Clothing is a fast-growing brand of lifestyle apparel & MMA gear with a growing national presence and over 50 authorized dealers across the USA. The Intimidation brand is regularly featured on multiple sporting events on FOX, SpikeTV, AXS TV, SportsTime Ohio, MTV2, FUEL TV, The Comcast Network, Comcast SportsNet and EpixHD as well as MMA highlight shows on Spike TV, AXS TV and more. In addition to over 110 styles of high-quality, bold t-shirts and sweatshirts for men, women and children the brand is well known for their popular Vintage Series, Local MMA t-shirts and Intimidate Cancer lines of merchandise. Anyone interested can become a dealer by applying to sell the Intimidation brand which is also available for sale online at IntimidationClothing.com. Fans can also follow the marketing wing of the Intimidation brand, Intimidation Interactive Media, @IntimidationIM, like Intimidation Clothing on Facebook or follow @IntimidationMMA on Twitter. Multiple Intimidation-sponsored fighters were featured in AXS TV’s “Best of 2012,” including three fighters who helped expand the Intimidation brand to a much larger national base in 2012. The most notable of the fighters who were featured was Chidi “Bang Bang” Njokuani (pictured, right), who was sponsored by Intimidation during his destruction of Phil Dace at RFA 4 in November. The younger brother of UFC lightweight Anthony Njokuani put a beatdown on Dace for more than two rounds, before eventually stopping him via TKO just 41 seconds into the third frame. The win was the fourth in a row for Njokuani, who has also won 7 of his last 8. He is expected to return to the cage in early 2013. Other fighters who were featured were Chris “The Hammer” Holland and David Mays. Holland was sponsored by Intimidation in his August loss to Braulio Estima at TitanFC 24 in August, and Mays was sponsored by the popular clothing brand in his XFC 19 bout against Nick Newell, which he lost via KO in the first round. In addition to the above, Johnny Buck’s KO of Ricky Rainey at XFC 19 in Charlotte was one of the cable TV station’s top knockouts of the year. Intimidation Clothing is a fast-growing brand of MMA apparel & training gear based in Ohio with a strong presence throughout the Midwest USA and a growing national presence. The Intimidation brand is regularly featured on multiple sporting events on SpikeTV, AXS TV, SportsTime Ohio, MTV2, FUEL TV and EpixHD as well as MMA highlight shows on Spike TV and HDNet/AXS TV. In addition to over 70 styles of high-quality, bold t-shirts and sweatshirts for men, women and children and is also known for their premium-quality EliteFighter MMA board shorts. Intimidation Clothing products can be found for sale online at IntimidationClothing.com and fans can follow the marketing wing of the company on Twitter, Intimidation Interactive Media, @IntimidationIM. 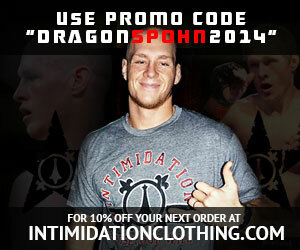 Follow Intimidation Clothing on Facebook and @IntimidationMMA on Twitter.